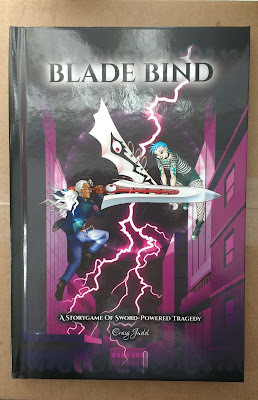 I've been reviewing and revising Blade Bind over the last couple of weeks, having settled on an approach that addresses as many of the problems discovered during playtesting as possible. Yet, recently I realised that with all the changes, I've kind of removed an important element that's been in the rules since the start. This is going to get a bit game-mechanics technical, but hey, it's the name of the blog, right? Voluntarily, at the start of a Duel: This is important because it represents your Blade tempting you to accept more Power, and because it's your decision that will ultimately doom you. Automatically, on a loss: This is important because it's a consolation prize. If you win a duel you get to change things to achieve your goals, so on a loss you gain more Power which both brings you closer to losing control and makes you more likely to win your next fight. In some of the playtests, it became apparent that Power values were getting too high too quickly, resulting in duels with lots of cards that took longer to resolve without being more enjoyable. There was also a problem at the start of the game where the first character to lose a duel would end up two Power ahead of anyone who hadn't been in a duel yet, which is a huge difference early on. You gain Power voluntarily, at the start of a Duel (as above). On a loss, you lose a point of Will from your starting pool: Everyone starts with three free points of Will. As far as becoming Bladebound goes, it doesn't make a difference whether you gain Power or lose Will, so this is a handy way to keep the pacing the same while preventing Power inflation. If you've already lost your three starting Will, you gain a point of Power instead. I ran a playtest with the revised rules, and it all seemed to go well. People started to risk going Bladebound at about the same time as they ran out of their starting Will and began gaining Power, so there was a sudden explosion of Power just as the game came to a climax. Brilliant, right? I thought so, but then I re-read a passage I wrote about how defeating your friends just makes them more powerful so they can come back and hit you harder next time, and realised it was no longer true. Winning or losing doesn't really affect how likely either side is to win or lose next time. I have one possible solution, but it may require a little tweaking, playtesting, or feedback before I lock it in. It's the same as the revised version, but with one addition: On a loss, you also gain a point of Resonance. Resonance is the power-source for your Blade's special Techniques, super-powered moves that allow you to break the rules in interesting ways. Normally you only gain Resonance when your Blade binds against another (like the game's name, right? ), so it can be a hard-to-get resource. Gaining Resonance on a loss doesn't increase your card-count, but it does make you harder to beat. I think it's a cool idea because I'd like to see more Techniques used in play, and having more Resonance will certainly increase the opportunities to use them. I'm thinking of tweaking it so you gain 1 Resonance for each point of Will you've lost so far (so, 1 to 3), which would be huge since the 3-Resonance Techniques are very powerful. However, I'll need to playtest this idea in a full game to see if that amount of Resonance will unreasonably affect the flow of the game.